The key to sustainable weight loss is burning fat for energy. Many people claim that our preference for fuel is actually sugar, but this isn’t the case. When we are born, we burn fat for energy. We only stop burning fat for energy when we are loaded up with too much sugar and carbohydrate. We have to get rid of that sugar (it is quite hard on the body) with the goal of getting back to fat burning once the sugar is gone. So you can imagine that if we consume too much sugar and carbohydrate daily, we end up with a problem and we won’t ever get back to burning fat. We then become permanent sugar burners. How do you know if you are burning fat for energy? 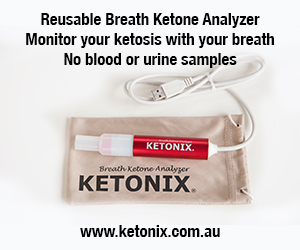 Measure your ketones. Our brain can only function using two different types of fuel; glucose or ketones. In fact, our brain runs optimally on a mixture of both glucose and ketones. Remembering that we can only store a small amount of glucose at any one time, if our brain operated on glucose alone, it would be a problem if we weren’t able to get food for a significant period. If we can’t store more than 24 hours’ worth of glucose, then using glucose as our only source of energy doesn’t work. In fact, we would die fairly quickly if we were hunting our own food and not reliant on supermarkets. Fortunately, we also produce ketones. The liver converts fatty acids and amino acids into ketones. Not only do the ketones help fuel the brain, but they are also a fantastic energy source for the rest of the body. And, we need these ketones for basic survival. Our hunter-gatherer ancestors would have been ketogenic; there simply was no other way to live. It would have been impossible to gather enough carbohydrate to start using glucose for fuel. Being ketogenic is how we survived. And, it is the key to getting back to our natural, fat burning state, and therefore, the key to sustainable weight loss. Measuring ketones is one of the easiest ways to stay on track and stay motivated, because you will know whether you are on track or whether you need to lower your carbohydrates. To put our body back into a fat burning state, some people need to lower their carb intake lower than others, depending on the state of their health, whether or not they have insulin resistance, and more.